When an artist has his or her artwork published by a dealer, gallery, card producer, calendar producer etc. then the publisher will usually expect the artist to sign their standard contract. These publishers contracts will set out the details that both parties have agreed. They will crucially include these categories. Identify who is involved. The artist and the publisher. What image. Picture and Title. What uses the publisher has stipulated. Who the audience is. How much the artist will be paid. And how often. Flat fee or royalty. So lets go through these five sections and examine them from the artist’s side. The artist might be operating his or her business using a limited company format. If so, do the artist’s limited company own the copyright to the artist’s image? Artists should be aware of the basic fact that they usually do own the copyright of their image unless it has been commissioned. If their own limited edition company effectively commissions the image then the artist should make sure that the ltd. co. is healthy and that they continue to own and control it. And even more importantly does the publisher operate their business in separate corporate layers as well? Possibly the publisher is firstly the printer/producer, and secondly the distributor, and maybe even the retailer. The artists contract might look good with a nice healthy agreed percentage of the sales price going to the artist. But beware because it has been known for the printer/publisher to sell to a sister distribution company. They pay the artists royalty percentage on the first transaction and ignore later business. This enables them to make the big markups and profits on distribution and retail sales without the artist getting any more. The artist should be careful that they don’t agree publishing rights with separate publishing businesses for the same image. Unless the publisher agrees. Of course the artist can produce similar images for different publishers. But usually publishes like to have exclusivity. An artist who can self-publish needs to make sure that the agreement contract enables them to continue to self-publish. The artist who prints and publishes in house has an advantage in that they can sign and number their self-published work very quickly. They can produce a valuable quality product at a premium price. Whereas a standard commercial publisher will take much longer, probably sell unsigned versions, without numbering, and use cheaper paper. Another incidental factor to any artist/publisher contract is that the publisher will probably be promoting the artist as a brand. The artist might benefit by being made famous instead of being made rich. So if possible artists should sign their artwork with a legible signature, and encourage the publisher to promote their brand by providing good story lines and other copy for the publisher to use. What uses the publisher has stipulated. Print publishers might want to produce open edition prints on paper, sometimes also called posters. Or they might be in the fine art limited-edition market where the product has to be signed by the artist. Those are extremes, and there is also a central sector selling good quality fine art prints on paper and canvas that do not require a fresh signature from the artist on each item. Or the publisher might be only interested in producing calendars or greetings cards for instance. The contract should specify that. The artist should be free to self publish the image or even licence the image for other uses. Don’t let the publisher have complete and unrestricted use of the image. No one knows in advance whether an image will be popular. We probably can take good educated guesses, but we are often wrong. Publishers have been known to ask for rights to a whole bunch of an artists work and never actually produce or sell as a product. They could be doing this as a way of just preventing other publishers from producing rival products. A year, or two years, or more? A typical art print publisher will take ages before actually selling anything. The contract might be agreed in the Summer but the sales start to appear many months or so later. That is fair enough because they will be finding and agreeing any new product way in advance. Then they have to produce and show the product to trade buyers. They might want to launch your new product at trade fairs like the Spring Fair in Birmingham in February. Only then can they hope to reap the benefit of their product. But of course the public won’t see the product until even later. It could become a good seller a year after the contract was agreed. The publisher will want to be able to benefit. So expect the contract to cover this possibility. How much for the artist. Flat fee or royalty. This is the difficult question. Of course the artist may not be offered a choice. Typically a card publisher and calendar publisher will offer a flat fee as standard. Whereas a print publisher will probably offer a royalty where the artist gets a percentage of the sales income. For artists a royalty agreement can be attractive because they will not have any of the production, marketing, or selling costs of a potential best seller. Publishers know this of course and so the royalty percentage is low. Calendar producers plan ages ahead. So a flat fee upfront is good for the artist. Also they might want 6 or even 12 images. Actually 13 if they also use a cover image. Wow! 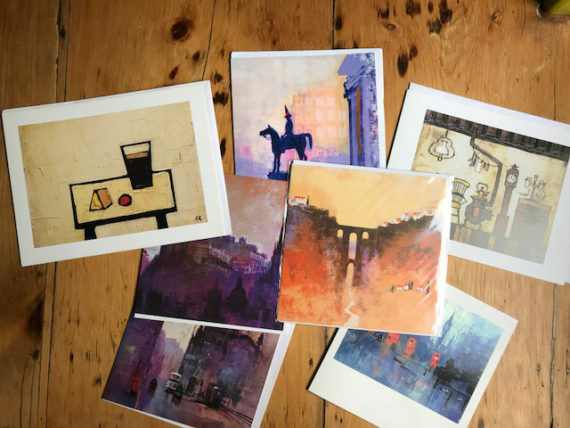 Greetings cards can be all year round but the BIG market is for Christmas cards. Flat fees usually apply. These basic five factors in the publisher artist contract are equally important. Maybe the possibility of becoming famous rather than rich is the real prize for an artist. Next articleBusiness to Business, or Consumer ? B2B, B2C + VAT.